Carrot Benefits For Skin. 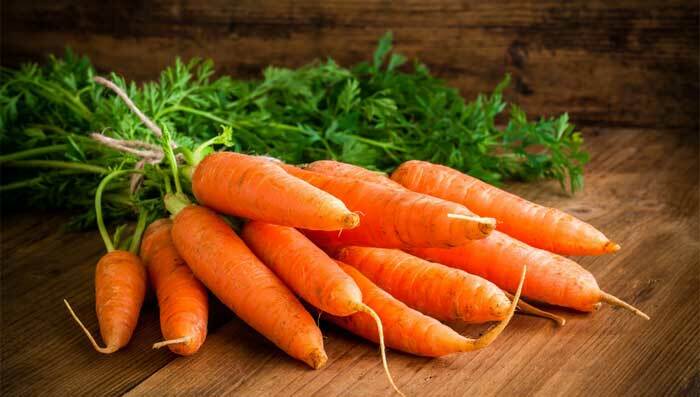 While beauty products and cosmetics have become a way of life to keep your skin looking flawless they do have their side effects, certain root vegetables like carrot with their antioxidant/anti ageing properties help to keep your skin healthy and a healthy skin for sure is a flawless skin. We all have repeatedly heard that carrots offer many health benefits for organs like eyes, teeth and the digestive system. You will be surprised to know that carrots are beneficial for the well being of the skin too. With its antioxidants called carotenoids, vitamins, dietary fiber, protein and potassium carrots provide a number of health benefits to the skin and fights against diseases. Our skin is constantly under stress due to our habits/hygiene and exposure to harmful UV rays that generally people first think to visit the beauty salons. Especially in summer, skin becomes dark because of tanning, pigmentation and freckles and the reason behind is mainly over exposure to UV and UVB rays. Your skin can be smooth, shiny and whiten just like its effect on the beauty salon by eating vegetables. Diet plays a significant role similar to face packs and beauty treatments. Using vegetables is an ancient technique to combat summer effect on the skin. Come let’s find out the benefits and some home remedies of carrot for a flawless skin. The fact that carrots can be used in any form (raw/juice/facemask) helps in a lot of benefits for the skin. Dry skin is usually caused by deficiency of potassium in the body. Carrots are a rich source of potassium, and daily consumption automatically leads to skin hydration and moisturizing. Carrots can also be used to prepare home remedies for glowing skin, all you need to do is mix grated carrot with honey and apply it as a facemask to get a glowing skin. Carrot facemasks are usually convenient and inexpensive to make. Carrots healing properties have been known for centuries. The abundance of vitamin A, beta-carotene and its anti inflammatory properties which are present in carrots, help in reconstruction of tissues. Grated raw carrot is used externally on wounds and cuts to stimulate the healing process. It can also act as an antiseptic and prevent infection. We have various cosmetics and sunscreens that help us protect our skin from the harmful UV rays of the sun from the outside but they do come at a price. Carrots on the other hand help to protect the skin from the inside, they are rich in carotenoids and are a good source of vitamin A.
Carotenoids are pigments that give many fruits and vegetables their vibrant colors, and they provide increased protection against sunburn, especially when combined with vitamin E.
Carrots are the best natural source of vitamin A, which is known to treat acne effectively and is free from any side effects that medicine or drugs normally come along with. Apart from Vitamin A carrots also contain calcium and sodium that also work as an acne natural remedy. Several research studies have proved that deficiency of calcium in the body can lead to acne breakouts in the skin. Thus carrots serve as an excellent alternative to include calcium in your diet and cure acne naturally. Last but not least, carrots also contain fiber, which further makes it a proven acne natural cure. Fiber ensures that your digestive system works well, and flushes toxins out of the body naturally. This helps in reducing acne breakouts. In general, carrots are a great anti aging veggie. Filled with alpha and beta-carotene, carrots actually act as an antioxidant, which help repair call damage cause by your very own metabolism. Vitamins A and C present in carrots aid collagen production in our body. Collagen is a type of protein that is highly important for skin elasticity. It helps protect the skin from wrinkles and controls the process of aging. Exfoliation is the process that involves the removal of the oldest dead skin cells on the skin’s outermost surface. It is a beauty treatment that removes dead skin cells and promotes a uniform and radiant complexion. Carrots contain natural powerful antiseptic that kills germs, protects skin from free radicals and promotes the regeneration of healthy skin. Carrot exfoliating facemask are very easy to make at home and is very effective as carrots do have a hydrating, soothing, regenerating and revitalizing effect on the skin. Blemishes are skin imperfections which are usually caused by oil clogged pores and stress. Carrots are the richest source of vitamin A, which are present in them in the form of beta-carotene. Vitamin A boosts the health of the skin and helps to cleanse these clogged pores. By applying mashed carrot paste on skin blemishes or alternatively applying carrot juice on them, the vitamin A helps in cleansing the pores and leaves you with a glowing and flawless skin. A mix of carrot and papaya can do wonders for your skin. If your skin is exposed to sunlight or dust and feels uncomfortable, a simple homemade remedy of carrot juice can calm your skin. This remedy can also work for sunburn. The antiseptic properties of carrot leaves your skin feeling revitalized and fresh. Because carrot seed oil is high in antioxidants, it’s a natural skin moisturizer. The oil has moisturizing vitamin E and protective vitamin C, which work together to help bring new life to the skin. In fact, carrot seed oil has a reputation for helping with sensitive skin too. When increasing pollution, dirt and dead cells get accumulated over your face they leave behind black spots. Carrots are rich in vitamins and antioxidant (beta-carotene) that help in whiten the skin. They are also called the “herbal healer” of skin diseases because they endorse the repair of skin tissue. A carrot facemask is easy to make, no side effects and is inexpensive when compared to the various cosmetic whitening cream available in the market. Take carrots that are washed, peeled and grated to which u add 2 tea spoons of honey and an egg yolk. Bring it to a paste form and put it on the face carefully (evade eyes and mouth). Let it be on the face for 10-15 minutes and then wash the face with warm water.